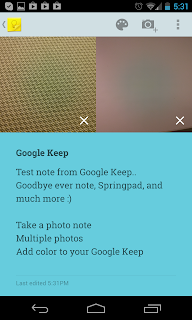 Google has launched a new Note taking app Google Keep for Android.If you are the one (like us) looking for a one stop solutions for all your Notes, ToDo List, Docs, Presentations etc Google Keep is the destination for you. Yes your notes and task lists are synced with Google Drive. Is this the time to say Good Bye to other apps like Ever Note, Springpad, etc ? 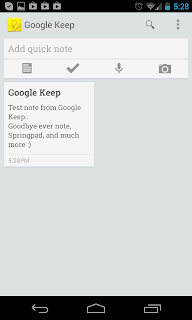 See the full review of Google Keep. Taking quick notes on your Smart Phone and continue with the documentation on your PC once you are at home is the task which most of has been waiting for a long time, especially on a single platform. Till date we had this was done in a two independent platform or apps. Not anymore , you can take notes with voice and Photo and edit them as a a complete doc using Google Drive once you are back home. 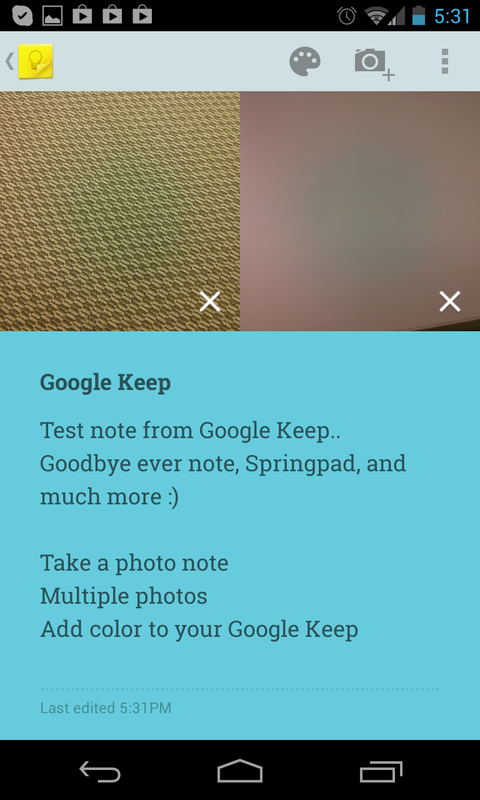 Google Keep gives the following features on your Android Mobile Phone. Other Note taking apps like Ever Note and Spring Pad have much more extensive features when compared to Google Keep at this point of time, but it doesn't have full fledged integration with office like Google Drive. 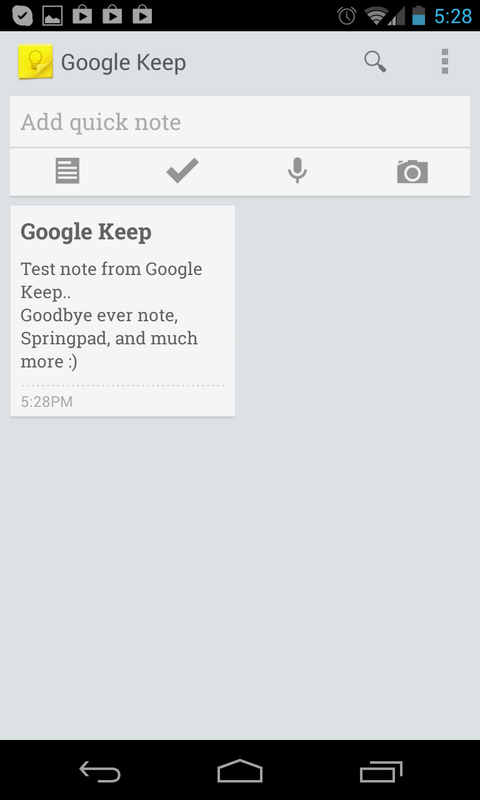 and of course Google is going to add more and more features to Google Keep to make it to the level of Evernote. Though Google Keep looks promising, lacks the features like adding reminders, text highlighting etc which the other apps has. 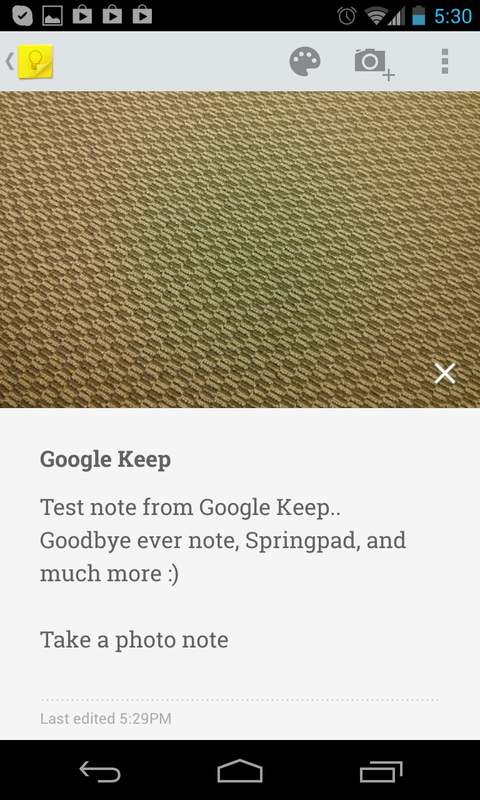 If you are an extensive user of Evernote, we dont think you will completely move to Google Keep right away. 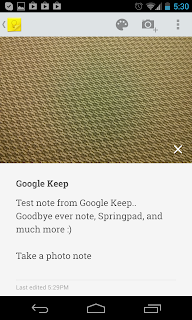 Do let us know if you are moving to Google Keep on the comments section.